Miss Avalon was recovering from being sick and catching up on a mountain of homework, so with her approval and input, Miss Margot made a cupcake wrapper flower Valentine's wreath! I'm feeling the love for Valentine's Day this year, how about you? 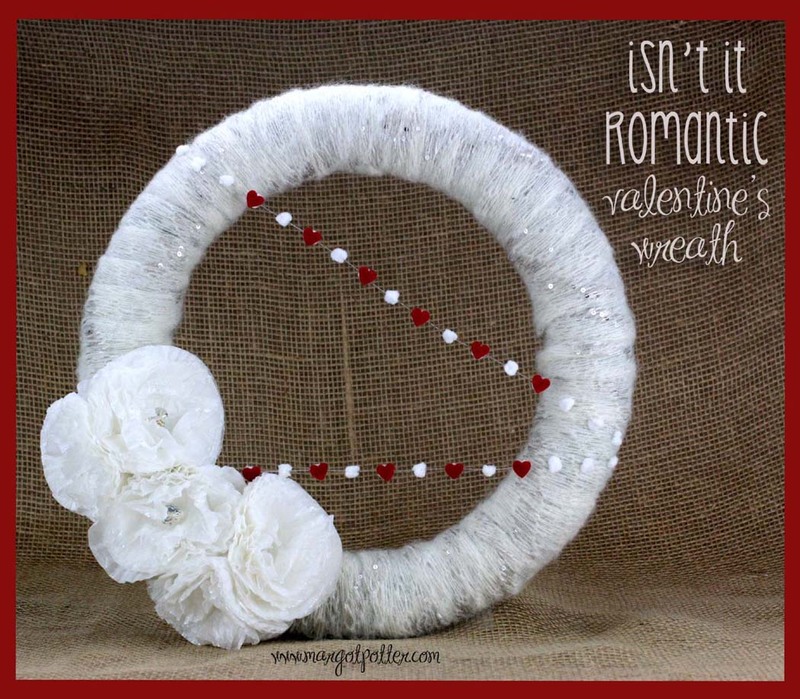 Taking the holiday decor down is horribly depressing, but how about cheering things up with a festive 'Isn't It Romantic' DIY Valentine's Wreath? What say you? Shall we? Making these cupcake wrapper peonies is so fun and they're so pretty, you can hardly tell they started out as cupcake wrappers! 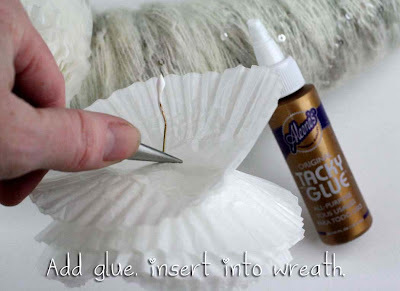 The key is using white glassine cupcake wrappers, the non-stick coating and translucence make them easy to scrunch and form and with a little scrunching and effort, they take to dyes and inks and glitter beautifully. 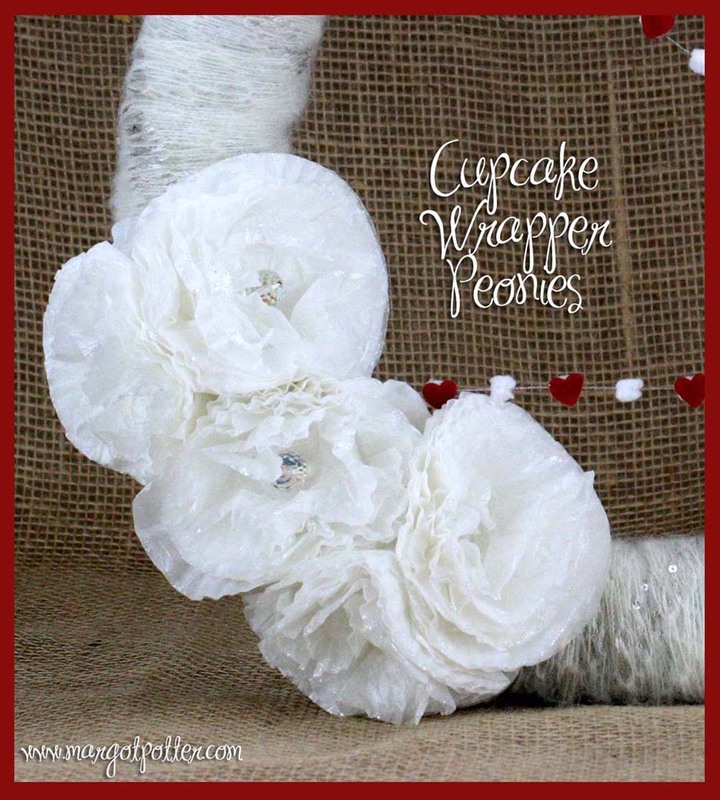 I have only just begun making these flowers, and now you can too! 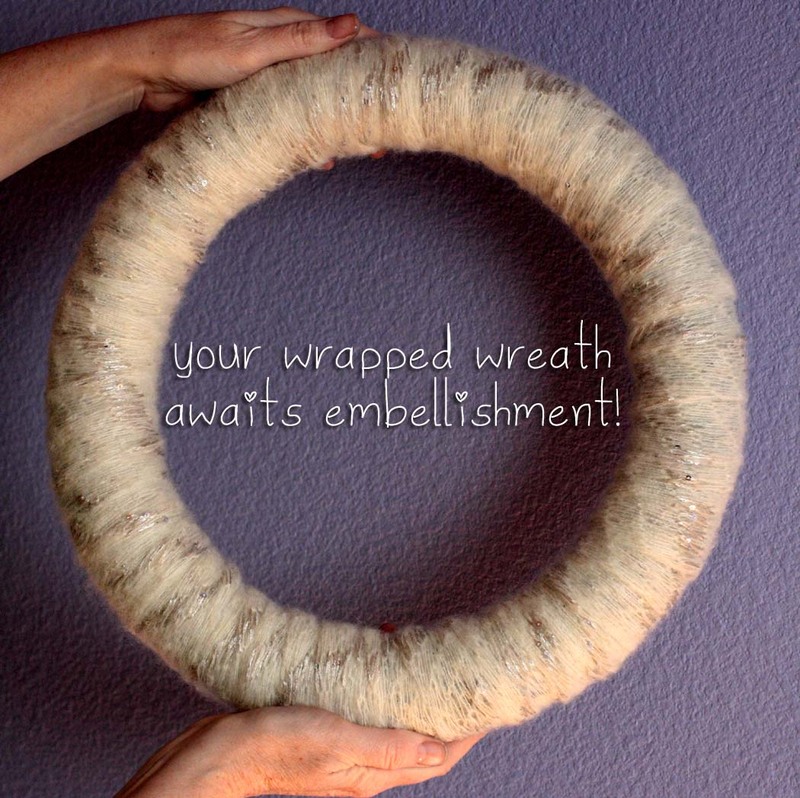 I used some yummy Red Heart Rigoletto yarn in cream to wrap my foam wreath base. 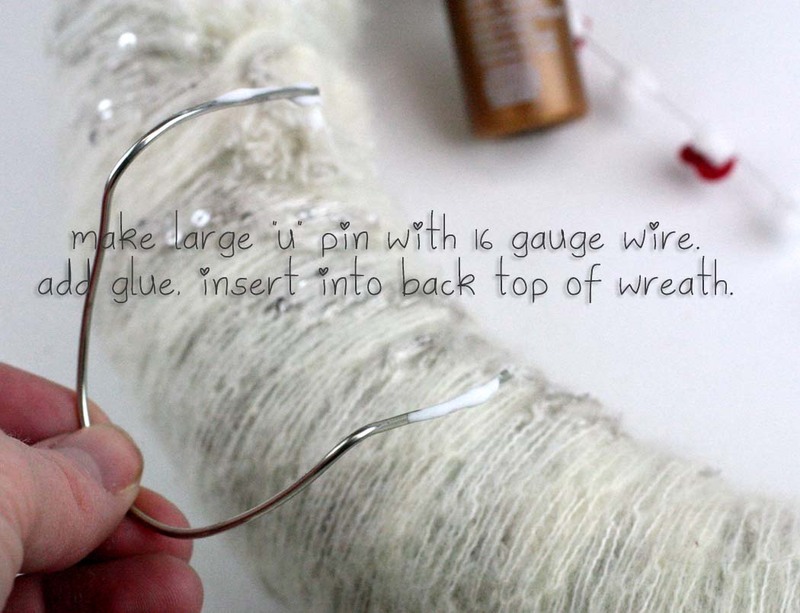 This yarn has sequins in it for a little subtle sparkle. Wrap your entire wreath and then tie a knot. Cut off the excess yarn. 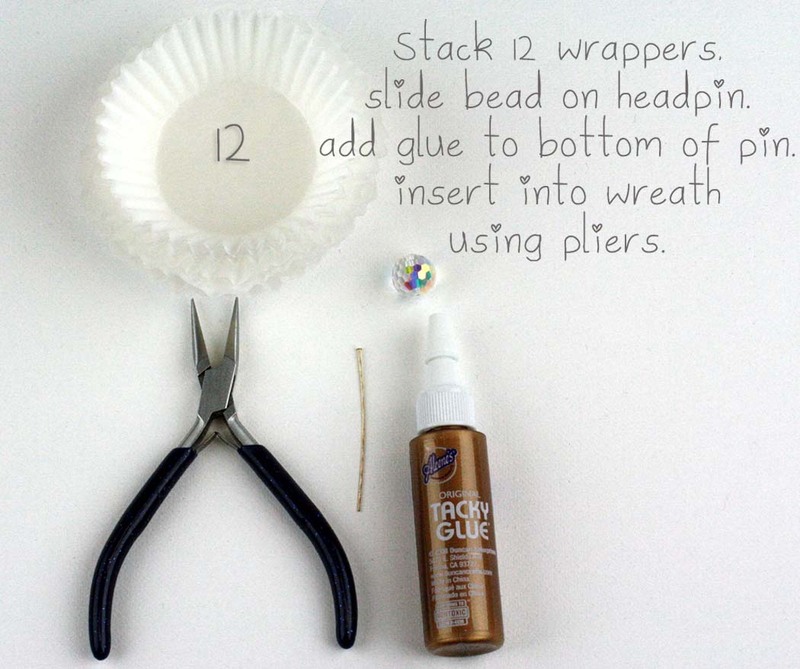 You'll need 12 wrappers for each flower, head pins, SWAROVSKI ELEMENTS or other faceted sparkly crystal beads, Aleene's Tacky Glue and a pair of chain nose pliers. Dip the head pin in glue after you've inserted through into the center of your bead and cupcake wrapper layers. I suggest pre-punching the hole with a pin to make it easy to get the head pin through them. Insert this into your foam wreath using the chain nose pliers to really get it in there! Now comes the fun part. 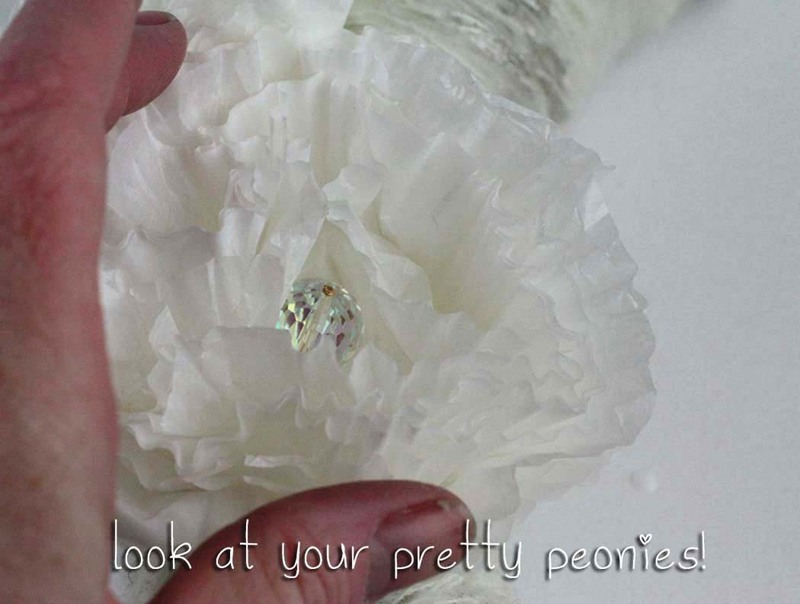 Once the glue on the five flowers is dry, you need to scrunch the layers to make them look like poppies. I do it one layer at a time, scrunching and squishing, then once you've scrunched all twelve layers, open them up to expose the crystal center. 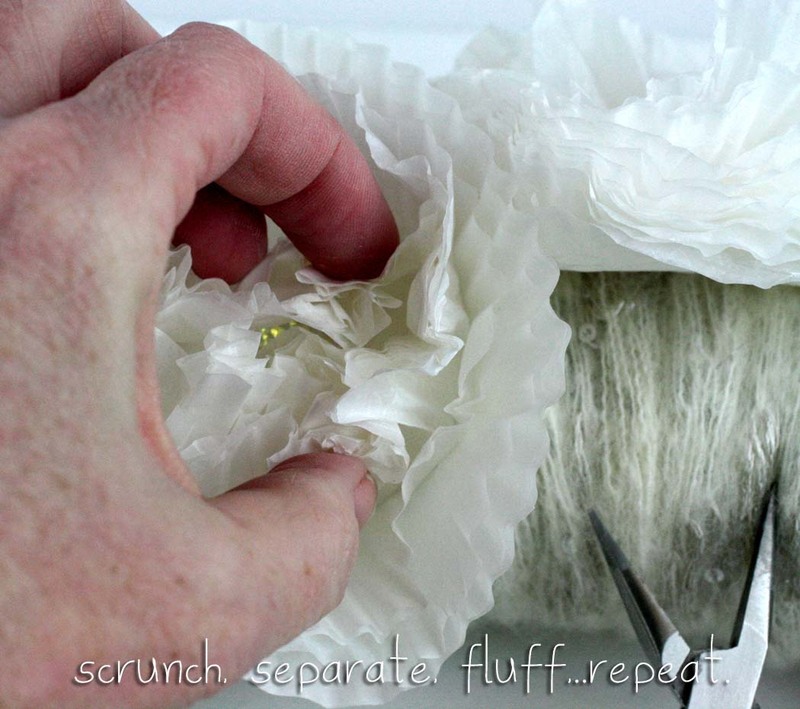 Keep scrunching, separating and opening until you are satisfied with the results. I loved these flowers, but they needed just a skootch more sparkle. I wanted subtle...so after some experimenting I came up with a mix of Tulip Glitter Bond and Tulip Fashion Glitter. (My studio was cold, your adhesive should be more runny and less chunky! 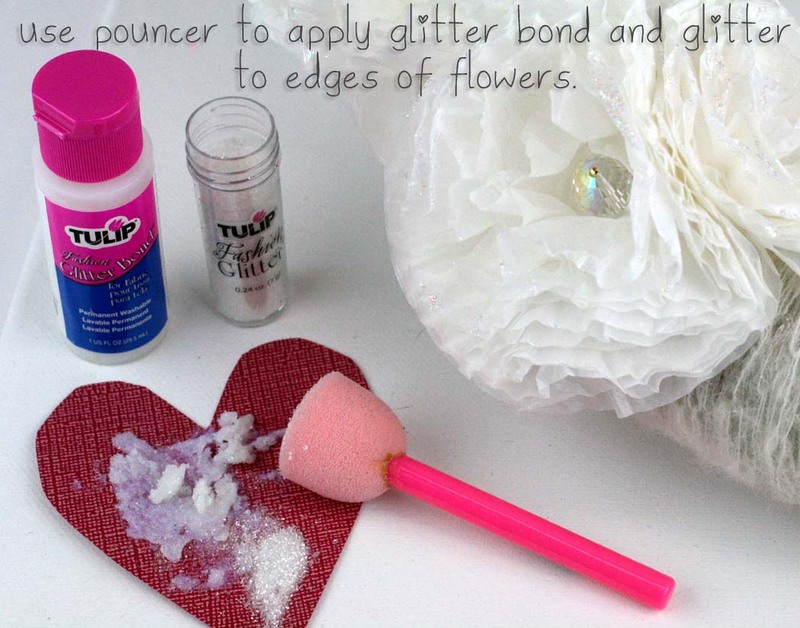 Dip your pouncer in the Glitter Bond, then into the glitter and gently dab on the edges of your Peonies. Allow this to dry! I used some wired pom pom trim I scored at Michaels on clearance recently to add some interest to the center of the wreath. If you can't find this exact trim, use sparkling thread and glue the pom poms and the hearts on, or thread pom poms on thin wire. 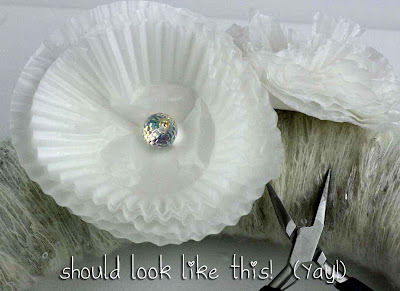 Or use a thin sparkling ribbon and glue pom poms on the front. 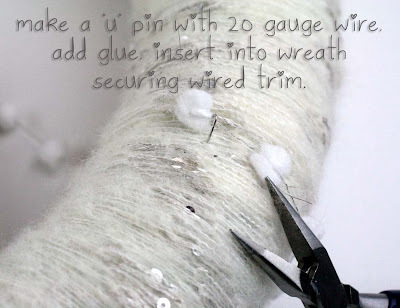 Wrap wire around edges, use "u" pins made from 20 gauge craft wire or bent head pins to secure. 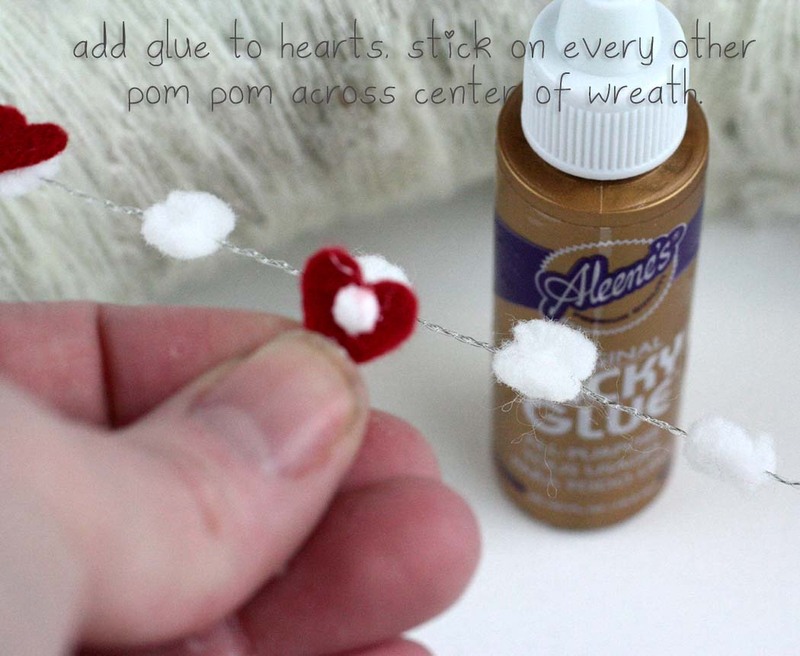 Dab glue on wire before inserting into back of wreath with chain nose pliers. I wanted just a little pop of red, I tried ribbons and a variety of other approaches but it all looked ticky tacky. Avalon remembered I had some red felt hearts! Perfect! You can punch some red paper hearts out if you can't find felt. You can hang your wreath with a large ribbon bow or you can add a hanger to the back using 16 gauge copper craft wire. Just form a "u" bend wire arms down with chain nose pliers, add Tacky Glue and insert into top back of wreath using chain nose pliers. I love this hung inside of an empty large gold frame...or of course, on a door! Sweet...Imagine this in color, too! Yup! I am thinking of one for spring in technicolor! It's funny, because I tend to use bright colors. You can dip the wrappers in dyes and stamp them, it's kind of endless! So cute. Might have to try this one.